The ancient ceremony of the Boar's Head Carol (for its history see Wikipedia) was performed for many years on Christmas Eve at Queen's College, Oxford, but now on a Saturday shortly before Christmas, when old members are entertained at a “gaudy”. The College Choir processes into the Hall during the refrains, stopping each time when a verse is sung. When the boar's head is set down on the high table, the Provost distributes the herbs among the choir and presents the solo singer with the orange from the boar's mouth. In 1969, The Young Tradition split up while recording their album of Christmas songs with Shirley and Dolly Collins, The Holly Bears the Crown ; and it was only in 1995 that the album was finally released. 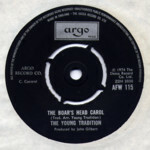 But two songs from it, The Boar's Head Carol and Shepherds Arise (here called The Shepherd's Hymn) were published by Argo on a single in 1974. 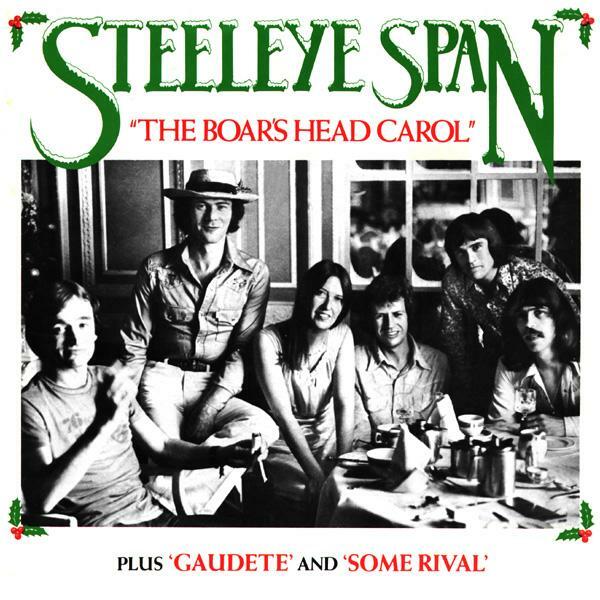 The Boar's Head Carol was Steeleye Span's 1977 British Christmas single, recorded in Holland, with the B-side containing the two tracks Gaudete and Some Rival. They reissued The Boar's Head Carol in 1981 on the Australian-only LP Recollections and in 1999 on the CD A Rare Collection 1972-1996 . Two other versions with Maddy Prior and the Carnival Band appeared on their albums Carols and Capers and Carols At Christmas . A live recording from the Maddy Prior, Family & Friends Christmas tour of 1999 was released on the CD Ballads and Candles . Magpie Lane sang The Boar's Head Carol in 1993 on their Beautiful Jo album The Oxford Ramble . A live version recorded at the Roman Catholic Church of St. Dunstan, Woking, on December 8, 2012 was part of the December 24, 2012 entry of Andy Turner's blog A Folk Song a Week. Sung every year at the Christmas Boar's Head feast at Queen's College, Oxford, and one or two other noble institutions—clearly in an attempt to combine brain and brawn! This manner of singing to one's Christmas dinner has been around in one form or another for six hundred years at the very least. 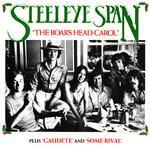 During my brief spell in Steeleye Span, I contributed this arrangement for a Christmas single in 1977. It-s a well-known song, and everyone's done it, but I have to keep it in because the chord progression going up to the new key is such fun to play, even without the band and the brass section blasting away. Interesting fact: Songs like this which combine workaday English and scholarly Latin are called “macaronic”. Blessed are the pasta makers! This proud and ancient carol is traditionally sung at Queen's College, Oxford, at Christmas time in thanks for food and praising God. It features in the Oxford Book of Carols and is sung regularly in the Derby areas. For Sid Long. A chorus of Jon Boden, Jess and Richard Arrowsmith, Gavin Davenport, Fay Hield and Sam Sweeney sang The Boar's Head Carol at the Royal Hotel in Dungworth as the December 9, 2010 entry of his project A Folk Song a Day. In Reginensi atrio [in Queen's Hall].